Which Time Lord is your favorite incarnation of Doctor Who? If it's Matt Smith's 11th Doctor, you can achieve his trademarked look by adding this 11th Doctor Bow Tie to your favorite tweed jacket & white shirt. Everyone you meet will trust you. You're a doctor. 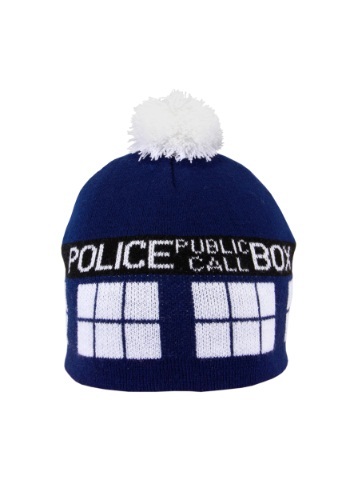 Take your very own TARDIS along wherever you go when you wear this Adult TARDIS Pom Beanie! You'll be ready for time-traveling adventure to save the universe from Daleks and Cybermen. And, you can find out if the TARDIS really is bigger inside than outside. Should you jump in the TARDIS to save a few civilizations from imminent demise, or head to bed for some sleep? 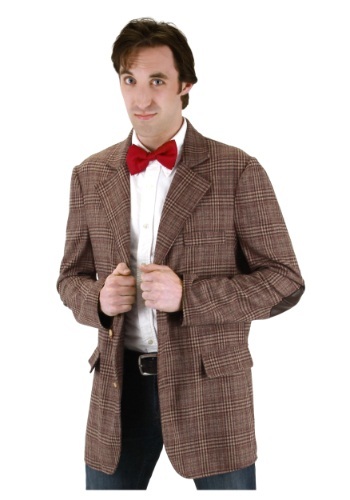 When you wear this Doctor Who 10th Doctor Cosplay Pajama you'll be ready for either. It makes sure you feel comfortable, whether you're fighting some Daleks or curling back under the covers for some more rest. When you're a Time Lord you need to make sure you look good. Because as you travel the universe through space and time you'll end up in such places as New Earth and planet Midnight. And when you end up on these new worlds you'll want to make sure that you're dressed for any and every occasion. That is the exact reason why the Doctor picked a great looking blue suit for his 10th incarnation. In this suit he has dined with royals and put a stop to evil alien plans. But if the Doctor makes his way to the snow covered planet of the Ood he may get a bit chilly and will need his very smart looking trench coat So if you find yourself traveling though all of space and time in your own TARDIS be sure to look as great as the Doctor with the help of this Doctor Who tee. When the Doctor crash landed his TARDIS on earth after his regeneration he met a young Amelia Pond and she nick named him the Raggedy Doctor due to his dishevelled appearance. When he returned 16 years later Amelia started to go by the name Amy and they helped stop the Atraxi from burning the planet. After that adventure the Doctor decided that he needed a new set of clothes and borrowed some from the hospital. Of all of his choices he found just the outfit of a tweed jacket, button up shirt, and of course a bow tie. Why a bow tie? Because they're cool of course!So now you can enjoy some fish fingers and custard while looking cool in this offical Doctor Who tee. 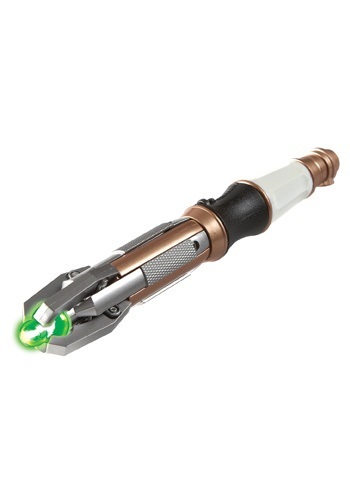 Portray the 11th Doctor with your very own sonic screwdriver. This licensed replica will allow you to own a piece of the most successful science fiction show ever. Have fun discovering all the amazing functions of the sonic screwdriver! When the Doctor went into his 4th incarnation he wanted to have a different look from frilled shirts and velvet jackets. So after his regeneration he searched the TARDIS for something new but what he found was a set of clothes that brought back a classic style. The 4th Doctor would sport a bohemian look featuring an old jacket, a classy vest, and of course his iconic scarf. Now some would think such a long scarf would get in the way of adventures through space and time but just the opposite was the case for this Gallifreyan. His scarf would in fact aid him in may situations and would help safe many civilizations. So if you're a huge fan of the classic Doctor Who series be sure to pick up this tee. We do apologize that this shirt does not come with your own K-9 robot. "I suppose the best way to find out where you come from is to find out where you're going, and then work backwards. 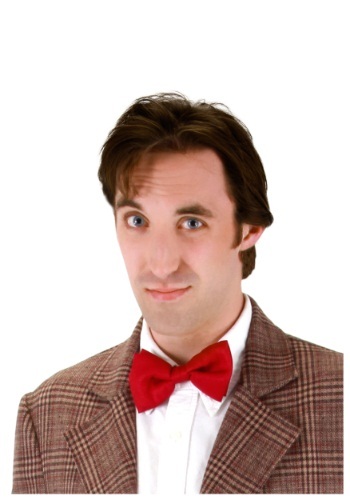 "One of the Doctor's most famous faces was that of his 4th incarnation. He was known for his out of control hair and his classic long scarf. So if you're going to go on a trip through the stars and through time you can't beat copying the look of the 4th Doctor with this robe. Just be sure to have enough Jelly Babies to share with your new companions. You'd have to admit, Matt Smith was one Time Lord that always looked dapper. How could a bow tie be anything but dapper? 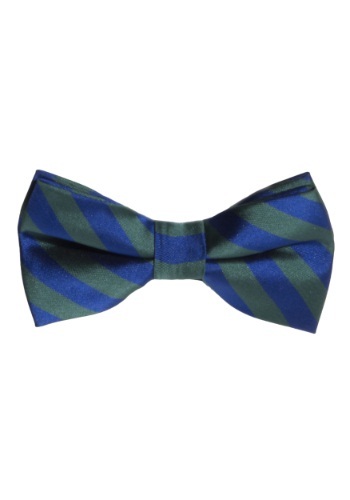 If you are wanting to look like Doctor Who in the iconic episode, "Day of the Doctor" you're going to need this Doctor Who 50th Anniversary Bow Tie. 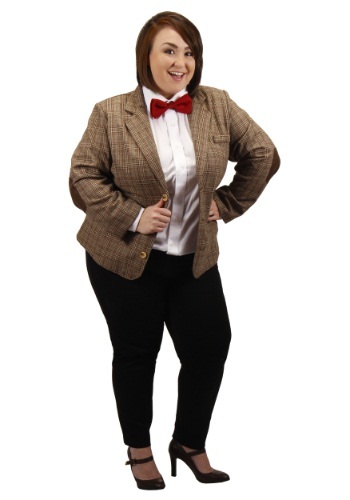 Pair it with our Eleventh Doctor Suspenders and you are all ready for some cosplay! Time travel never goes quite according to plan. Sure, you might have been able to travel to the exact moment in time you had planned to head to, but then there's an evil Time Lord there or some Daleks causing trouble. That's why it's always handy to keep a few extra provisions around in your TARDIS backpack, which is standard issue for anyone who's name is the genuine article. Doctor Who? Just The Doctor, thank you very much. Did you check the weather before you decided to head out for a full day of exterminating? 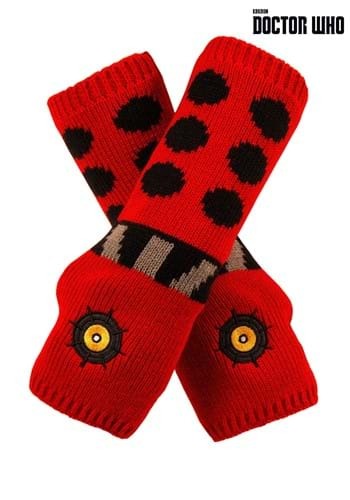 If it's chilly, you'd better bring these Doctor Who Dalek Handwarmers. Not only do they help keep your hands nice and toasty but the help you feel a little more in the mood for destroying inferior beings! It's been said that clothes make the man and that goes doubly true for Time Lords. When the Doctor took on this 11th face he also needed a new wardrobe and lucky for him he had a hospital full of choices. So the fresh faced time traveler ditched his raggedy clothes for a tweed jacket and bowtie, because as we all know that bowties are cool. Now you'll be set to fly the TARDIS to adventure when you wear this high quality jacket worthy of a Time Lord. Geronimo! "Bow ties are cool." When traveling through space and time one must be well dressed for any occasion. To maximize your look you could add a fez or maybe even a Stetson but nothing in this universe can match the awesomeness of a bow tie. This simple but fantastic accessory impresses everyone from Queen Nefertiti to Queen Elizabeth the 10th. So pick up this bow tie and get ready for an adventure! This Doctor Who I Am TARDIS Costume Hooded Sweatshirt is a marvel of Time Lord technology. It compacts the normal elements of the time machine used by The Doctors in various adventures into apparel that you can wear. It does have some limitations though. It only sends you forward through time at a normal rate of time. In other words, you will experience time as normal, but you'll just look way better while doing it. 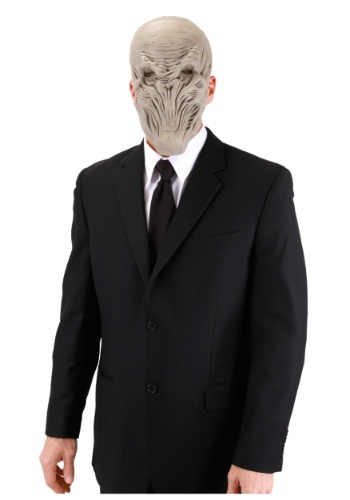 When the Doctor regenerates he has to pick out a brand new outfit to match his new face. After he saved the planet from the Atraxi he found just the right jacket to travel through time and space in. With this "borrowed" coat he has gone on adventures with Amy and Rory putting a stop to the Daleks and Silurians. 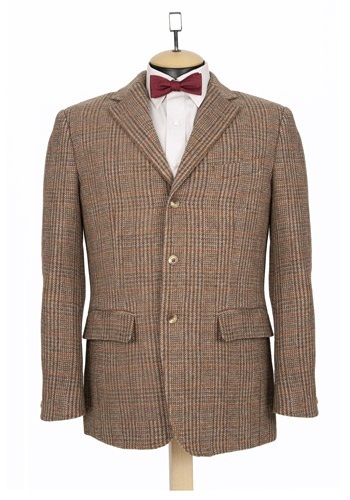 Now you can look just like the Doctor when you slip this coat on and add one of our great bow tie accessories. Don't forget your sonic screwdriver either!"Geronimo!" You can dance across space and time with this great dress. Imagine fighting aliens and looking cute as a boot all at the same time. 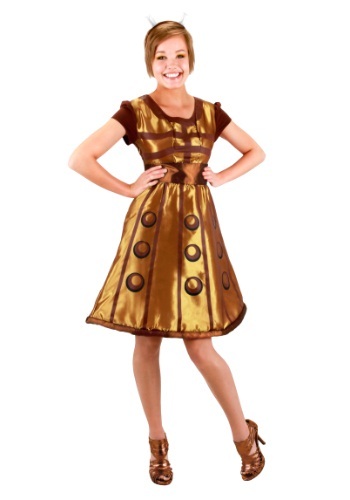 You'll easily be able to channel the power of Dr. Who's Tardis machine and a world class ballerina in this costume! If you're going to travel through all of space and time you're going to need a comfortable robe. Now you can stay comfy in the TARDIS while wearing the TARDIS in this official Doctor Who robe. We are fairly certain that wearing this robe while in the TARDIS shouldn't cause any time ending paradoxes, fairly certain. But to be safe you should pick up one our Sonic Screwdrivers to fix anything that might happen. Doctor Who wouldn't be able to get a whole lot done without his Tardis machine. If you're thinking about emulating the famous time machine, you can start with these authentic slippers. Add some of our other officially licensed accessories, and you'll have an awesome costume that doubles as comfy around the house attire! The Tenth Doctor, as portrayed by David Tennant, was a dapper dresser with a quirky twist. Who else would wear red high-top sneakers with a pinstriped suit? 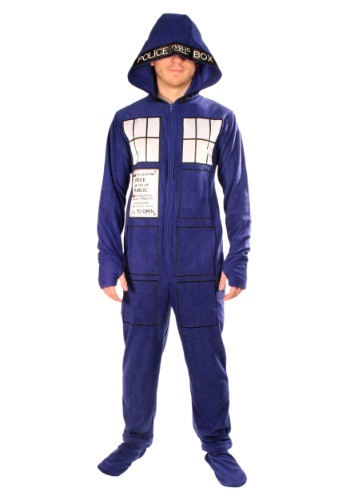 Get his look and sleep like a Time Lord in this Doctor Who: 10th Doctor Adult Sleep Set. But you'll have to provide your own high-tops. We've done it. We've mastered the art of time travel. It's actually quite easy. You just have to put this TARDIS union suit on, which is inspired by Doctor Who's trusty time machine, then take a nap for an hour. When you wake up, you'll be in the future, exactly one hour. Okay, so maybe we can only travel through time the regular way like everyone else, but taking a nap in this comfy suit makes regular time travel seem all that much more fun. If you have an uncontrollable urge to destroy all life-forms other than your own, you'll want to wear this Dr. Who Dalek Dress. Your friends will want to hide behind the sofa when you appear! As true Doctor Who fans know TARDIS stands for Time and Relative Dimension in Space. This means that it can go anytime and anywhere! Now this means the Doctor can show up where ever he wants (or where the TARDIS thinks he should be) to save the day. 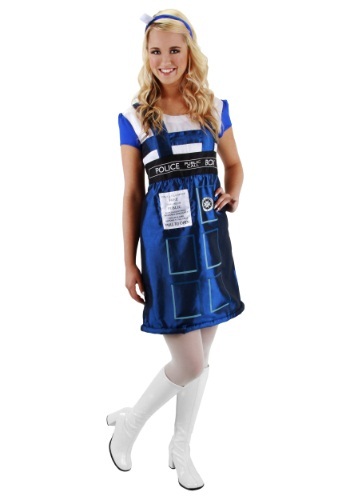 So if you're a true Doctor Who fan this dress inspired by the blue box it's self would be the perfect costume. Wear to a Halloween party or to an amazing celebration across the stars! Every time the Doctor regenerates he always picks out a new wardrobe. Sometimes he spends a great deal of time looking at some options and other times he sees an item and thinks it is just perfect. That is what the fourth Doctor did when he came across his fedora hat. Once he saw that he knew that it would go great with his scarf and be perfect to wear while searching for the Key of Time. 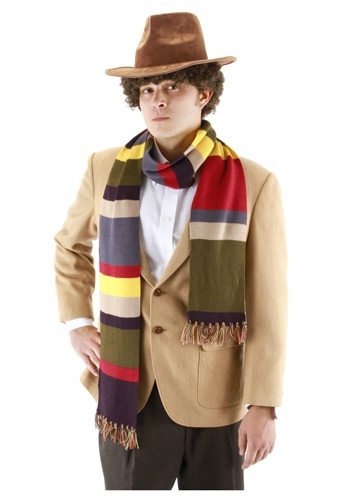 So if you're looking to complete your fourth Doctor costume this hat will be just the thing to top it off. 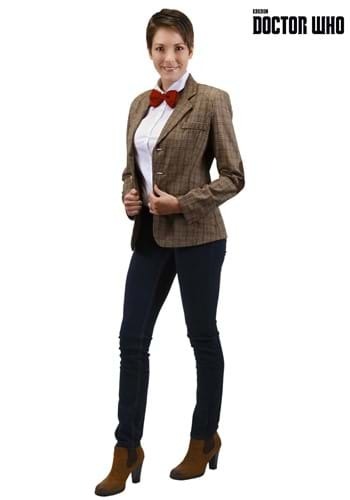 This Eleventh Doctor Womens Jacket is just like the one in Doctor Who, but fitted for women. Now you can pull off your best version of Matt Smith's Doctor without having to wear an ill-fitting coat. Now all you need to do is pick out a handsome fez to complete the look! What are all the cool kids calling these things nowadays? Braces? Suspenders? Matt Smith, the 11th Doctor calls them braces, but he's an Englishman! Pick up these Eleventh Doctor's Suspenders if you're a true Doctor Who fan. They do a great job of holding up your pants, plus they make you look like your favorite Time Lord! On one hand we could say you'll look cool as you travel through space, using your TARDIS to jump in and out of dimensions and having awesome adventures. On the other hand, we can assume you know this. 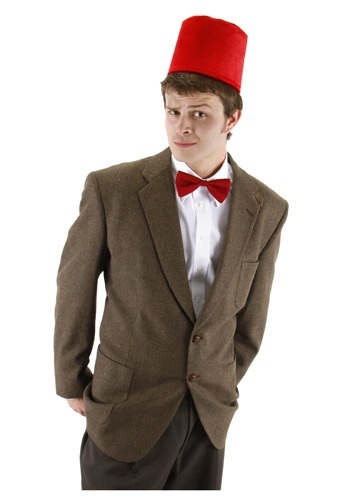 Why else would you be purchasing this Fez and Bow Tie Kit? Whovians know how to stay warm. Whovians know a serious scarf when they see it. Whovians wrap themselves up in this Fourth Doctor Premium Scarf when the temperature is a little nippy. Okay, a lot nippy! 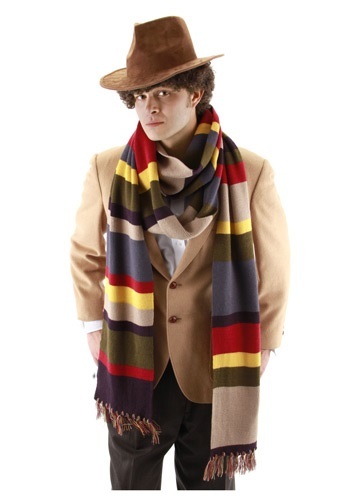 Wear this uber long scarfy wharfy and you'll have the swagger of Tom Baker. It doesn't get much cooler than that...or should we say warmer...? It’s time to jump into the TARDIS for an adventure of a life time! 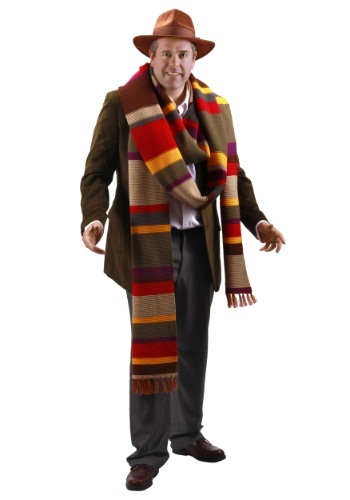 With this Fourth Doctor Who Long Scarf you’ll look like Tom Baker's fourth Doctor. Be careful of those Daleks! Jelly Babies (check), Sonic screwdriver(check), Fourth Doctor Who Short Scarf (double check). Now that you have every thing you need, step into the TARDIS and get to traveling. What's the deal with college professors and bow ties? A bow tie somehow carries an aura of academia. Your IQ could actually increase by 10 points when you wear one (not really--but one can dream)! Fight with Daleks day after day can take a lot out of a Time Lord and you don't want to waste any time getting ready for a nap after an exhausting adventure in the TARDIS. This Plus Size Doctor Who 10th Doctor Cosplay Pajama helps increase your nap-time by making you ready for some time-traveling capers or bed time without having to change outfits. The Doctor can return to life over and over again in countless forms and personalities, but isn't it great that his sense of style always seems to remain intact? Sure, it gets questionable at times... (looking at you 4th Doctor!) but he somehow always pulls off the 'charming yet cool and sophisticated' look. The 11th Doctor here even made bow ties look cool! We're not sure how he did that... but he did and we're the ones who benefit. And now, the latest formation isn't just for men, it's for women too. Our Plus Size Eleventh Doctor jacket for women is officially licensed and even has those snazzy elbow patches. Because, you know, elbow patches are cool. 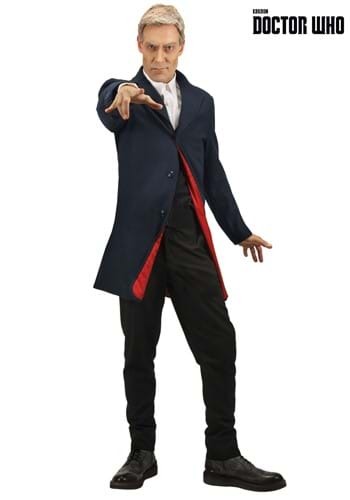 Become the doctor played by Peter Capaldi with this officially licensed Plus Size Twelfth Doctor jacket for men. It is made from a dark blue faux-wool polyester blend fabric and is fully lined to create a high quality garment. Your IQ may not actually increase when you wear this Red/Blue Striped Bow Tie--but you can maybe fool your friends into thinking it did! Add the tie to any suit and you'll instantly look like a scholar. You might even get invited to give a lecture. When the time has come for the Doctor to die...guess who is going to show up to witness it.? The Silence! 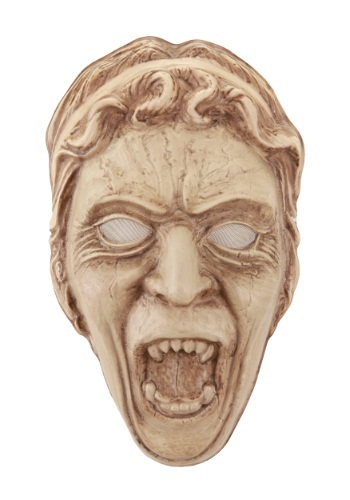 Whisper the terrifying phrase, 'Silence will fall' while you wear this Silence Half EVA Mask. Reptilian humanoids that can predict the dawn of man? Only in Doctor Who! 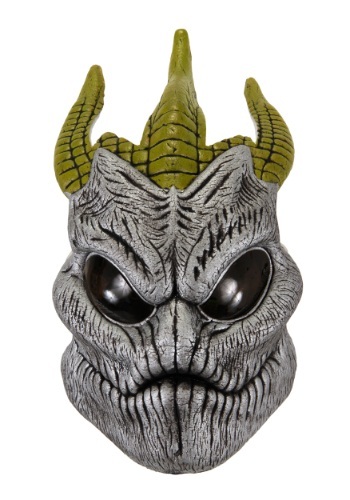 Now you can be hungry for Earth while you wear this Silurian Half EVA Mask. Gobble up every last human until the end of time. When you're traveling through time like Time Lord, your hands can get chilly. 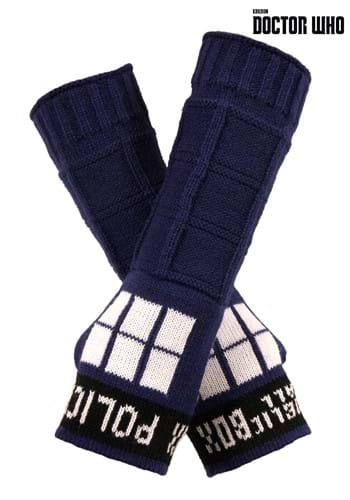 Licensed from the BBC show, Doctor Who, these TARDIS Armwarmers were designed to keep your hands toasty warm, no matter where your adventure takes you, whether you're just going out for some fall weather, or you're planning on foiling another Dalek scheme. We all know that bow ties are cool, but not everyone can rock a bow tie quite like the Doctor. 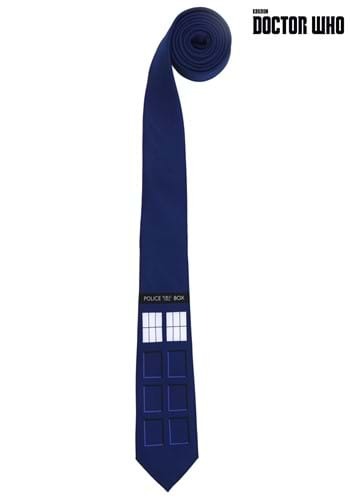 We're here to tell you that neckties are ALSO cool and this Doctor Who Tardis Tie is about as cool as they come. With a fashionable slim design and the Police Box design made famous by the BBC show, it can spruce up any dress shirt you have. (It can also be worn like a headband, but we're not sure if The Doctor would approve). What's the best accessory for an adventure through time and space? A Sonic Screwdriver, you say? Nonsense? A fez hat? Don't be ridiculous! This Tenth Doctor Swirly Tie is the best answer! David Tennant made sure to bring it with during most of his tenure as the Doctor Who lead and we all know that he knows best when it comes to Time Lord fashion. Can you free the TARDIS before time runs out? 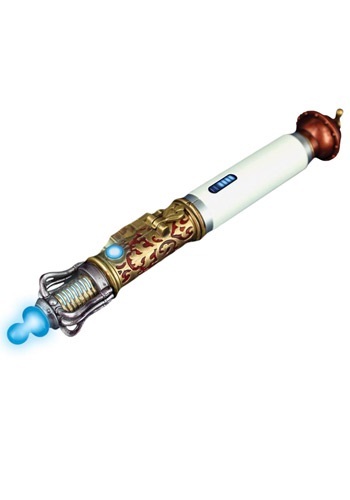 With this replica Trans-Temporal sonic screwdriver toy, you might have a chance! This famous tool from Doctor Who is a must have for fans!